I don't think I ever officially thanked Pantone for naming Tangerine Tango the 2012 color of the year. Thank you Pantone! I'm thrilled that the invigorating red-orange hue has made itself from the fashions of this past Spring/Summer onto the Fall runways and into stores. From Coach's structured handbag to Band of Outsiders' wool jacket, we can take a sigh of relief that Tangerine Tango is here to stay another season. My current closet obsession is a fire orange Parker silk peplum bustier blouse (seen on me above and *on sale here*), which I will be happily wearing into fall with a leather pencil skirt. I love the dress, dear! Great color. I so need to get my head out of the sand and get with this orange trend. I had no idea it was so big this year. Everything is beautiful! I just love this colour! orange is such a great color! especially when paired with white! Love orange!! In summer or in winter is one of my favorite colors.. I love those L.A.M.B. heels!!!!! Love the J. Crew shoes! Agreed! I've been working this hue everywhere from my wardrobe to my latest designs! Love that this bold orange almost passes for tomatoe red, makes my heart skip a beat everytime she appears! Especially in print, soooo FAB! definitely one of my favorite shades, especially for accessories. also love a more poppy, coral orange! I love that first shirt oh and the bag and the dress and everything else lol! These are all beautiful outfits. The colors were attractive and cute. I am completely obsessed with those lamb shoes and the tory burch sweater! love the colour so much! looks pretty on summer, isn't it? Thank you for this post! :) Orange is my favorite color! I used it in my wedding (back in '01). I think people thought I was crazy...who's crazy now?! Come to think of it neither have I! I'm loving this shade so much! Oh I love this colour so much!!! You have selected some brilliant pieces!!! 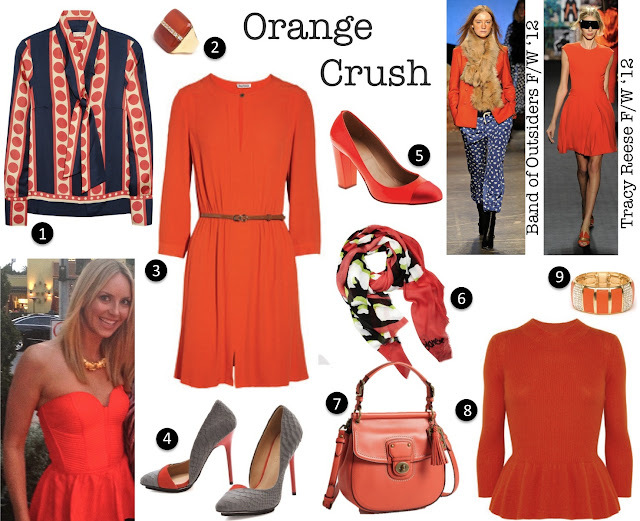 I've been really loving orange too – it's an awesome color for all seasons, too. Love those pumps! I especially love the Coach bag! Love orange! I love the shoes #5! I love all these pieces! Especially the printed blouse!